Next time that someone says that you're glowing, check that they don't mean it literally. 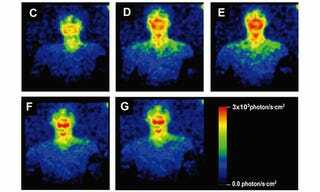 Researchers in Japan have finally managed to prove the existence of the human body's bioluminescence with these first-ever pictures of the body's natural shine. The human body literally glimmers. The intensity of the light emitted by the body is 1000 times lower than the sensitivity of our naked eyes. Ultraweak photon emission is known as the energy released as light through the changes in energy metabolism. We successfully imaged the diurnal change of this ultraweak photon emission with an improved highly sensitive imaging system using cryogenic charge-coupled device (CCD) camera. We found that the human body directly and rhythmically emits light. Apparently, the amount of light we emit - while always staying around a thousand times weaker than the eye can see - changes depending on the time of day, and goes in 24-hour cycles; we are at our brightest in the afternoon, and dimmest in the evening. Perhaps surprisingly, the amount of light emitted by our bodies doesn't correspond to the amount of heat given off, and thermal imaging provides entirely different visual results than the hyper-light-sensitive cameras.